A man walks past tents for supporters of jailed opposition leader Yulia Tymoshenko in Lviv May 4, 2012. When Ukraine was selected in 2007 to co-host this year's European soccer championship  one of the biggest sporting events on the continent  it was supposed to represent a chance for the former Soviet Republic to finally cast off its reputation as an Eastern European backwater and move closer to the West. Now, about a month before Euro 2012 is scheduled to kick off on June 8, the plight of jailed former Prime Minister Yulia Tymoshenko is threatening to turn the tournament into an own goal for the country and its authoritarian President Viktor Yanukovych. Tymoshenko, the gold-braided hero of the Orange Revolution that blocked Yanukovych's first run at the presidency in 2004, has been jailed since October after receiving a seven-year sentence for abuse of office. She claims she was badly beaten on April 20 when prison guards transferred her to a hospital to treat her chronic back pain. Since then, Tymoshenko has been on a hunger strike  and Western leaders have become increasingly vocal in their demands for her to be freed. Secretary of State Hillary Clinton has called for her release and a number of European leaders have said they will boycott the Ukrainian-held soccer games next month. The increasing pressure over Tymoshenko comes as Ukraine is already suffering from bad publicity over alleged sweetheart contracts for tournament preparations, astronomical hotel prices and recent explosions in an eastern Ukrainian city. "Euro 2012 isn't going to be the triumphant presentation of the country we dreamed of five years ago," wrote Mustafa Nayem, a columnist for news website Ukrainska Pravda, on May 2. When Ukraine was chosen to co-host the tournament with neighbor Poland, the Orange Revolution was still fresh in people's minds. After the pro-Russian Yanukovych won an election that was widely viewed to be rigged, thousands took to the streets to protest the result, forcing another election that was won by pro-Western Viktor Yushchenko. But Yushchenko's term was marred by infighting between him and Tymoshenko and the duo's inability to overhaul the country's suffocating bureaucracy and tackle endemic corruption. Delays to much-needed infrastructure improvements  demanded by the Union of European Football Associations (UEFA), which runs the European championship  prompted the organization to threaten to take away the tournament in 2009. In February 2010, Yanukovych took office after a narrow victory over Tymoshenko and quickly consolidated power by making changes to the constitution and appointing loyalists to the government. He also ordered efforts to prepare for Euro 2012 redoubled, touting the tournament as a way to bring Ukraine closer to the rest of Europe. Construction of airport terminals, roads and stadiums accelerated. And UEFA was duly impressed: Last month, Yanukovych won praise from Michel Platini, the head of the organization, who said that a meeting with the Ukrainian President in 2010 was the only thing that convinced him the country would be ready to host. But hurrying the preparations came at a price. Critics accuse top officials of handing out large state contracts to well-connected companies. "Euro 2012 started as a way to attract investment, but turned into a feeding trough for top officials," says Ostap Semerak, an opposition lawmaker. The government has denied any wrongdoing, saying it selected firms fairly. As preparations sped along, Yanukovych also tightened his grip on the country. Prosecutors and the Ukrainian security service, whose chiefs are appointed by the President, opened criminal probes into Tymoshenko and a dozen of her allies. Tymoshenko was convicted in a trial the West condemned as politically motivated. A second trial for embezzlement and fraud starts later this month, which could see Tymoshenko's term increased to 12 years. A top Tymoshenko ally and former defense minister was convicted of abuse of power last month, as well, resulting in a five-year prison term. The West has slammed the prosecutions as politically motivated. Following Tymoshenko's conviction, the European Union shelved a planned free-trade and political-association agreement with Ukraine. Then, after Tymoshenko's camp published photos on April 27 showing three bruises she claims were caused by her prison guards, European leaders began announcing their boycotts of this summer's soccer tournament. Jose Manuel Barroso, the European Commission President, said he wouldn't attend any games in Ukraine, as did the governments of Austria and Belgium. A German government spokesman says German Chancellor Angela Merkel's attendance at the tournament "is conditional on the fate of Ms. Tymoshenko." In addition, at least 10 European leaders, including German President Joachim Gauck, have said they will not attend a Central European summit hosted by Ukraine later this month. 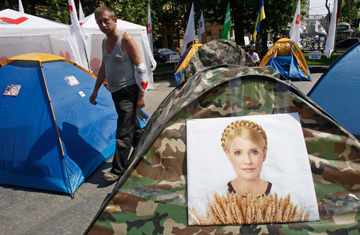 Despite the condemnations, prosecutors have refused to open a probe into Tymoshenko's alleged beating. The government has also reacted angrily to the threats of European leaders to boycott the games. A spokesman for Ukraine's Foreign Ministry said a boycott would be a Cold War tactic. "The attempt to politicize sports events is destructive," the ministry said in a statement. For Yanukovych, the main concern appears to be the effects a public snub by European leaders would have on his ability to portray himself as a leader who can bring Ukraine closer to Europe ahead of parliamentary elections in October. "The argument that (the government) is doing something in the European direction is under serious threat," says Alyona Getmanchuk, director of the Institute for World Policy, a think tank in Kiev. Tymoshenko isn't the only headache for authorities  security has become a concern, as well. On April 27, four bombs exploded along a tram route in the eastern city of Dnipropetrovsk, injuring 30 people. Ukraine has no known terrorist threat, and authorities have been tight-lipped on who could have been responsible for planting the bombs. Some analysts speculate the bombings could have been related to a battle between criminal business groups, coming two weeks after the gunning down of a wealthy businessman in the city. But authorities insist the country is safe for the up to 1 million visitors who are expected to attend the tournament. Another major embarrassment for the country has been the price gouging that has seen hotel prices rise by as much as tenfold for the tournament. Platini, the UEFA chief, has accused "bandits and swindlers" for the price hikes, and critics say it could keep many fans away. The government has pledged to take measures to bring prices down. Some Ukrainians, meanwhile, have taken the defense of their country's reputation into their own hands. Maksym Prodan, a 26-year-old human resources manager, has started a website called rooms4free.org.ua, which helps connect foreign fans looking for a place to stay with Ukrainians who can host them. "We want to see as many people here as possible," Prodan says. "Politics and Ukrainian people are separate."